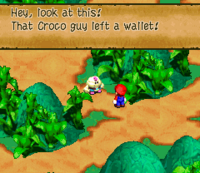 A Wallet is an item in Super Mario RPG: Legend of the Seven Stars. It belongs to a Toad from the Mushroom Kingdom. During the events of the game, Croco steals it from him, as well as Mallow's Frog Coin. When both party members defeat Croco, he gives up the Frog Coin, and unintentionally drops the Wallet upon leaving. If the player returns the item to the Toad, he gives him a Flower Tab. Later, when the player talks to that particular Toad whose Wallet has been returned, the Toad gives Mario a Flower Tab or a Frog Coin. Alternately, the player has the option of selling the Wallet for one hundred and twenty-three coins at a Shop. However, the Toad remains very mad at Mario for the rest of game if he finds out. This page was last edited on August 2, 2018, at 11:21.